Onkyo dips a toe in Blu-ray waters - plus more releases | What Hi-Fi? The CS-325 UK (pictured) is, unsurprisingly enough, a UK-tuned mini system with DAB and an iPod dock likely to build on Onkyo's solid reputation for well-engineered, finely-made entry-level audio. It will retail at £200. 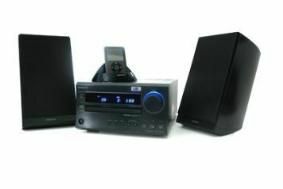 Onkyo have also announced the HT-S5105 surround package, which instead of a DVD player at its heart has an HD receiver. Audyssey 2EQ room correction technology aims to ensure a dynamic soundstage, no matter where it's used. Finally, advance information on the DV-SP406, which will play DVDs, CDs and MP3s. It's competitively priced at £100, but you can save £50 by buying as a bundle with the HT-S5105 surround package above for £400.